Wow. The Keyport sure is growing up quickly. Remember the Keyport renders i showed you back in April? Well time flies, and now you’re looking at actual images of real Limited Edition Keyports (granted they reserve the right to make some slight mods in the next week or so)… For those that need a refresher ~ the Keyport Slide is the “world’s first universal keyfob”… basically they are saying that you can have all your keys in one… from your house, car, office, locks, and even RFIDs. This first set is Limited Edition, and only 5000 will be made worldwide - available in silver, black, pink, and blue. It goes on sale early next week exclusively from the ‘reserve list.’ They will be sending out 1000 emails per hour to everyone in the world that has reserved the product on key-port.com since April. So how is this all going to work? After ordering, you receive a Kit which includes a box for 6 keys. You send the 6 keys you want in the unit in the FedEx envelope provided and they do the rest. Scared? Well they have apparently worked out a “guaranteed secure delivery method with FedEx” so your keys and address are never on/in the same package. You can even opt to pick up the final order at your local FedEx depot to further ensure your security. I can’t wait to show you some real pictures of the full kit, keys, and the whole process! For those of you concerned about the price, the $300 is only for the limited edition key-port. I think the standared “slide” will be about 35 give or take a few bucks. I have a transponder chip embedded in the head of my automobile key. Is it compatible with Keyport™? 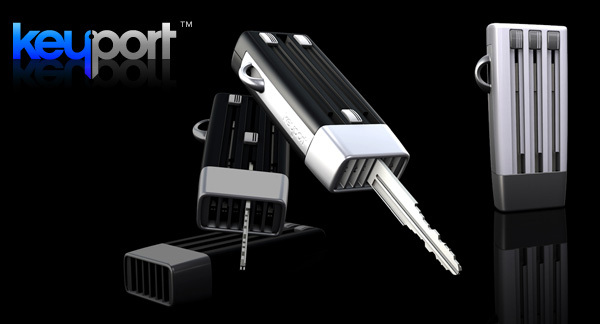 Yes, in most cases, we can transfer your transponder enabled key into your Keyport™. The back of my mind has been anticipatory about this fob. If i had the disposable income i would have one. I want to know what happens when you get a new car/house/apt/motorcycle/boat/i got a brand new pair of roller skates, he got a brand new key… i hope you get free cutting and fitting for the price of shipping. And yeah, i drive a (gm gas guzzler) i hope that it supports keys with security chips. Although many enjoy the after style, i must say that when i first saw the two, i liked the first modelling. Maybe it is because the black and white rather than plain silver, suits a car environment better, or the fact that because there are two components, two different materials are used. This may be the case, but the more i look at the second, after the initial thoughts of tackiness.. i think it is growing on me. Especially now that i read that it is made out of Aircraft Aluminum. Can’t wait to see it in Australia. i doubt airport security would let you on a plane with it. totally redikyouluss. 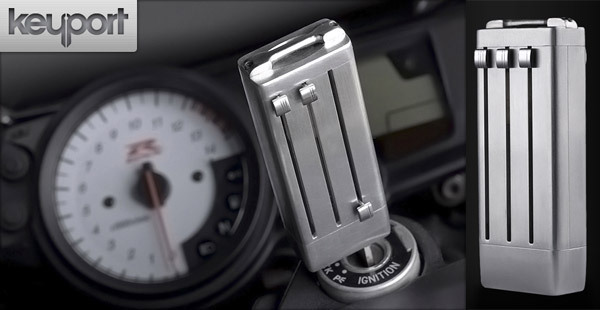 Also, it looks 100% rediculous sticking out of the motorcycle ignition on the GSXR in that first picture. Learn to spell ridiculous before you get in front of a computer, idiot. I’ve been waiting for this for quite a while and I’m disappointed by the price. Well, I was hoping the price was going to be half that, but what can you do? Wtf is a key fob? Is that a key that has a terrible accent and smells like he just got off a boat? Other than the fact that my dad has had a similar device for over 15 years, and so it is definitely not the ‘first universal key fob’, i love the look of this. Definitely more streamlined than my dad’s and the ‘after’ version is a great improvement on the ‘before’. As cool as that thing is, it’s definitely not worth $300+. I’ll hold out till there’s a $20 version.